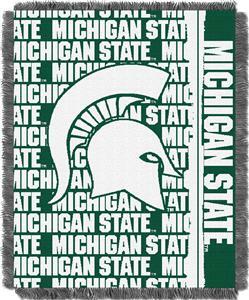 Northwest Michigan State Spartans Double Play Woven Jaquard Throw. Root for your favorite college team with an exclusively crafted throw featuring our Double Play Series design by The Northwest Company! This new design features your favorite college team's logo largely in the center, with a smaller version mirrored in front. This 48" x 60" throw has decorative fringes on all four sides and is made of soft, yet durable High Bulk Acrylic. It's easy to care for and holds up well even after repeated machine washing. The weaving process used in our triple jacquards allows for pure team colors, perfect for the die-hard fan. Root for your favorite college team with an exclusively crafted throw featuring our Double Play Series design by The Northwest Company! This new design features your favorite college team's logo largely in the center, with a smaller version mirrored in front. This 48" x 60" throw has decorative fringes on all four sides and is made of soft, yet durable High Bulk Acrylic. It's easy to care for and holds up well even after repeated machine washing. The weaving process used in our triple jacquards allows for pure team colors, perfect for the die-hard fan.